From the Middle Ages, London’s then ‘Northeast Suburbs’, Spitalfields, Bishopsgate and Shoreditch, were well known for industry, which was able to establish here outside the overcrowded City; but also for poverty, disorder and crime. Outside the City walls, they fell outside the jurisdiction of City authorities, so criminals, outcasts, the poor and rebellious clustered here. After 1500 Spitalfields underwent rapid urban growth. London expanded massively as large numbers of people flooded into the city: many dispossessed by rural enclosures, and deprived of the traditional welfare system by the Dissolution of the Monasteries under king Henry VII. In the City of London, trade was also expanding in many and varied directions, there were numerous jobs to be had, in both legitimate and illegitimate sectors. New rich classes were emerging, with new needs, requiring new services, and opening up exciting new chances to rob them. Neighbouring poor areas like Spitalfields absorbed many of these incomers. The district between Aldgate and Brick Lane became a centre for homeless and drifting people – “idle, vagrant, loose and disorderly persons” – by the early 18th Century. The Brick Lane area especially remained associated with severe social problems: according to Mayhew, the lane and the streets running off it included not only lodging houses but also considerable numbers of brothels. Brick Lane, said the Rector of Christ Church in the 1880s, was “a land of beer and blood”. Spitalfields housing was inevitably usually of low quality, overcrowded, run-down, often sub-divided, especially in the slums or ‘rookeries’. But Spitalfields has also been described as City’s “first industrial suburb”. From medieval times the area’s major employer has been the clothing trade; but breweries have also been major employers since 17th century, and later residents formed a pool of cheap labour for the industries of the City and East End: especially in the docks, clothing, building, and furniture trades. Small workshops came to dominate employment here. For similar reasons as those that led to the growth of industry and slums here, the area has always been home to large communities of migrants. Many foreigners in the middle ages could not legally live or work inside City walls (due to restrictions enforced by the authorities or the guilds), leading many to settle outside the City’s jurisdiction. Successive waves of migrants have made their homes here, and dominated the life of the area: usually, though not always, the poorest incomers, sometimes competing for the jobs of the native population, at other times deliberately hired to control wages in existing trades… Huguenot silkweavers, the Irish who were set to work undercutting them, Jewish refugees from late nineteenth‑century pogroms in east Europe, and Bengalis who have settled in the area since the 1950s. Many have been identifiably apart in religion or race. In the last decade or two newer communities like the Somalis have added to the mix. Colin Ward described Spitalfields as an inner‑city ‘zone of transition’, a densely populated ‘service centre for the metropolis’ where wave after wave of migrants had struggled to gain a foothold in the urban economy. By the early 18th Century there were numbers of Irish people living in Spitalfields. Due to their race, their religion (catholic, amidst overwhelmingly protestant English), by language, the Irish were often segregated, wherever they lived in England. London was no different – lodging houses, streets and neighbourhoods became generally Irish in character. Frequently they were extremely poor or destitute. The extreme poverty of the Irish locally was often noted. This lasted for more than a century: the radical Francis Place remarked in 1816 that the native poor of Spitalfields were better off than the Irish. Irish migrants were blamed for working for cheaper wages, especially in the building trades, and were on occasions attacked by ‘native’ workers. In summer 1736, reports spread of English builders being let go from the building of Christ Church, to be replaced by Irish workmen, said to be working below the agreed rate (supposedly at somewhere between half and two thirds of what the previous workers had been paid). “Tuesday 27 July 1736, the alarm was given by the Deputy Lieutenants of Tower Hamlets. They were barricaded inside the Angel and Crown tavern in Spitalfields, and calling desperately for reinforcements. Outside, the East End had erupted in violence. It was feeling against the Irish that triggered it. London was full of Irish workers. They flooded into the capital in search of jobs on building sites or out in the fields and, like all immigrants before and after them, they were accused of stealing English jobs. Within hours of the trouble starting, Walpole had informers mingling with the crowd, and sending back regular reports from public houses. ‘Some of [the crowd] told me,’ Joseph Bell scribbled hastily to his master, there was such numbers of Irish who underwork them, they could not live and that there was an Irish man in the neighbourhood who employed numbers of them & they was determined to demolish him and drive the rest away.’ It turned out that the contractor for Shoreditch Church ‘had paid off his English labourers and imployed Irish because they worked cheaper.’ The same thing was happening in the weaving industry. The Angel and Crown might have been on the corner of Whitechapel Road and Osborn Street. Several pubs known as haunts of the Irish were trashed or destroyed; crowds of between 2000 and 400 were involved. The Irish armed themselves and fought back, gunfire allegedly killing one attacker and wounding several others. The pamphlet goes on to blame the trouble on Irish provocation – a familiar story which continue wherever racists gather to harass, attack and murder migrants, yet its any migrants who resist who get blamed and arrested. Although resentment arising from competition for work was said to be the immediate spark for the pogrom, the general culture of anti-catholicism, dominant in Britain from the 16th century, and particularly sharp in London, may have also been lurking in the background. It has been suggested that the presence in Spitalfields of a large community of Hugenots, and their descendants, French protestants expelled from France some 50 years before, played a part in the trouble – though evidence of Hugenot involvement is scanty. In the 1680s, of course, ‘native’ silkweavers in the East End had petitioned to protest the immigration of 1000s of french weavers into their area, competing with them for work. This may not have precluded the Hugenots’ children from joining anti-Irish protests. Irish folk may by the 1730s have begun to move into the silkweaving trade, which Hugenots dominated, and Irish workers were later accused of undercutting the rate in this occupation (though I am not sure this was an issue in 1736). By the 1760s, however, Irish weavers were violently resisting wage cuts and sabotaging looms alongside the grandchildren of French exiles and the ‘native’ English. Which may well have some lessons for us in our own time. If only we ever learned from history, eh? Today in London’s radical history: Spitalfields silkweavers win laws to protect their wages, 1773. In the seventeenth and eighteenth centuries the silkweavers of London’s East End were well known for organizing collectively to defend their interests; often using violence if they had to. Their methods of struggle took a number of forms over the several centuries that the trade was strong in Spitalfields and Bethnal Green. Most often the journeymen weavers would be pitted against the masters, usually trying to keep wages high, exclude men working for less than the agreed rate, and sabotaging masters who paid too low… At other times organized violence was used to smash machine looms and threaten those using them, as the looms were seen as also lowering wages; in some ways the silkweavers foreshadowed the later struggles of the Luddites. The 1760s had seen silkweavers fighting a constant violent war to keep their wage levels up, which had ended in riots, secret clubs of weavers engaging in sabotage and extortion, responded to with executions, military occupation of the area, and murder of informers. Most accounts of the struggles of the weavers end with the hangings of the ‘cutters’ in 1769… But ironically, following on from this catastrophic defeat, the silkweavers were about to win one of their biggest victories. Although as a result of the battles of the 1760s, wage levels for silkweaving were fixed between masters and workers, nothing obliged the masters to keep to them. In 1773, further discontent broke out. Handbills circulated, addressed to weavers, coalheavers, porters and carmen (cartdrivers), to ‘Rise’ and petition the king. Silkweavers met at Moorfields on April 26th, incited by another handbill that read “Suffer yourselves no longer to be persecuted by a set of miscreants, whose way to Riches and power lays through your Families and by every attempt to starve and Enslave you…” Magistrates however met with them, and persuaded them to disperse, promising them a lasting deal. This materialised in the form of the Spitalfields Acts. The first Act, in 1773, laid down that wages for journeymen weavers were to be set, and maintained, at a reasonable level by the local Magistrates, (in Middlesex) or the Lord Mayor or Aldermen (in the City). Employers who broke the agreed rate would be fined £50; journeymen who demanded more would also be punished, and silk weavers were prohibited from having more than two apprentices at one time. The Act of 1792 included those weavers who worked upon silk mixed with other materials, and that of 1811 extended the provisions to female weavers. By conscious and collective class struggle, the weavers forced the stare, at least locally, to guarantee a measure of living standards. Obviously the interests of the authorities was partly in social peace; but the ruling elites were divided at the time as to the merits of paternalist intervention in industry, or laissez faire, allowing manufacturers carte blanche to exploit where they would, regardless of the consequences for the workers. Rival factions in the magistracy and London merchant classes could even enter in semi-alliance with rebellious workers or sponsoring strike-breaking gangs, as in the Wapping coalheavers and sailors dispute of 1768. One major result of the Acts, at least between 1773 and 1824, seems to have been an end to weavers’ riots and cuttings… or any strikes at all. It is argued in pamphlets in the 1820s that the Spitalfields weavers were also diverted from radical, reforming and revolutionary politics, especially in the 1790s and 1810s when other similar groups of workers were widely attracted to such ideas. For instance, no or few weavers were supposed to have taken part in the widespread food rioting of 1795. Local anger may have also been diverted in 1795 by the opening of London’s first ever soup kitchen in Spitalfields. Its founder, Patrick Colquhoun, stated that the aim of doling out free food was to prevent the poor being attracted by revolutionary ideas at the time of the French Revolution & widespread radical activity; he was a clever theorist of controlling the troublesome workers with repression and paternalism hand in hand, and was also instrumental in forming the Thames River Police, an important forerunner of the Metropolitan Police. So if it is the case that some weavers were skint while others worked, the Acts may have worked to reduce militancy and split the weavers movement. It’s also a factor, that although the rebelliousness of the weavers pushed the local state to step in and acts as an arbitrator, in the end this disempowered the workers. By the time the Spitalfields Acts were withdrawn, the immense pressure the organised weavers could put on the masters had been dispersed, replaced by a reliance on the Magistrates; this collective power couldn’t, as it turned out, be rebuilt when it was needed. In the 1770s the paternal idea of a local state intervention to keep the peace in everyone ‘s interest prevailed, but in the harsher times of the laissez-faire 1820s they were an expensive anachronism. Manufacturers may well have moved their business out to areas with less of a rebellious tradition however, whether the Acts had existed or not. It is certain that Repeal of the Acts in 1824, under the ‘progressive’ Whig program of economic liberalisation, was very unpopular among weavers (an 11,000 strong petition was got up in 3 days against repeal, and there were demos at parliament) and resulted in widespread wage cuts and extreme poverty. The trade was sabotaged. But the fight had seemingly largely gone out of the weavers… Although there were some strikes, loom-cutting and window smashing, it was ineffective. The East End’s silk weaving trade went into a serious decline in the mid-nineteenth century, although remnants lasted into recent times… But the collective power of the silkweavers of Spitalfields and Bethnal Green deserves to be remembered. Today in London radical history: silkweavers attack the East India Company HQ, 1697. The silkweavers of London’s East End had a long history of organizing collectively to defend their interests; often using violence if they had to. Their methods of struggle took a number of forms over the several centuries that the trade was strong in Spitalfields and Bethnal Green. Most often the journeymen weavers would be pitted against the masters, usually trying to keep wages high, exclude men working for less than the agreed rate, and sabotaging masters who paid too low… At other times organized violence was used to smash machine looms and threaten those using them, as the looms were seen as also lowering wages. At other times, though, masters and journeymen would broadly be united, in an alliance to defend the whole trade; usually when threatened by cheaper fabrics imported from abroad. For decades in the late seventeenth and early eighteenth centuries masters and weavers espoused protectionism against imported textiles, and put pressure, sometimes using riot and assault, on both parliament and other authorities to erect import bans or high tariffs, and social pressure on individuals caught wearing such garments… The extent to which there was manipulation of the mass of weavers by more powerful masters, to use them to extort favourable rulings in Parliament, is debatable – although encouraging collective violence was a dangerous game, as it was also turned on the masters regularly. One of their most powerful enemies of the weavers in this was the mighty East India Company, a global capitalist enterprise, run from London, which had large holdings in India and other parts of the far east… The Company was a major importer of silks from India, and other textiles. In 1697 silkweavers’ riots erupted, against imports on foreign silks, widely seen as undercutting prices for East London cloths. Again masters encouraged crowd violence. Weavers besieged parliament, marched on Lewisham’s silks mills to smash machine looms operating there; and on January 21st they attacked the HQ of the East India Company, (in Leadenhall Street, in the City: the site is now occupied by the Lloyds Building). They also threatened the house of Joshua Childs, the East India Company’s dictator. These disturbances as well as pressure from silk-weaving manufacturers’ organisations (such as the Royal Lustring Company, which had taken advantage of a Hugenot workman bringing to England the secret of giving a lustre to taffeta) in succeeding years led to several protectionist laws being passed in parliament in the 1690s and 1700 to protect the industry from competition from foreign cloths, especially French silks. 1719-20 saw another prolonged agitation, this time over imports of calico, dyed and patterned cloth from India, which had become very fashionable. Silk, wool and cotton weavers widely perceived calico as causing reduced demand for their products (calico was quite a bit cheaper. than silk..) Calico printing was now becoming an industry of size in London. In petitions to Parliament the calicoes were denounced “as a worthless, scandalous, unprofitable sort of goods embraced by a luxuriant humour among the women, prompted by the art and fraud of the drapers and the East India Company to whom alone they are profitable.” The protests of 1719-20 were to some extent successful, leading to a ban on calico, enshrined in the Calico Act, as well as penalties for anyone convicted of wearing printed calicoes. In 1765, however, wage riots broke out again; at a time of high food prices & unemployment. In May 8000 silkweavers, armed with bludgeons and pickaxes, paraded in front of St. James’ Palace with black flags, surrounding the Houses of Lords, after the Duke of Bedford engineered the defeat of a bill in the House of Lords designed to protect the silkweaving trade by placing high import duties on Italian silks. They then besieged and attacked the Bedford’s house, in London’s Bloomsbury. The fourth Duke of Bedford was a whig politician, in and out of various positions of power. But he also had extensive interests in the East India Company, which was again engaged in importing cheaper Indian textiles – also undercutting the weavers’ livelihoods, made him an even more hated target. The East India Company had also launched an imperialist war to seize economic power in India, defending trade monopolies with their private army. They caused mass starvation in 1769 and 1770 by cornering the market in rice and refusing to sell it except at exorbitant prices. Using genocide and mass starvation, they gained almost complete rule over in the sub-continent. Their control led to rebellion and mutiny, most notably in 1857; it also sowed the foundation of the British Raj. 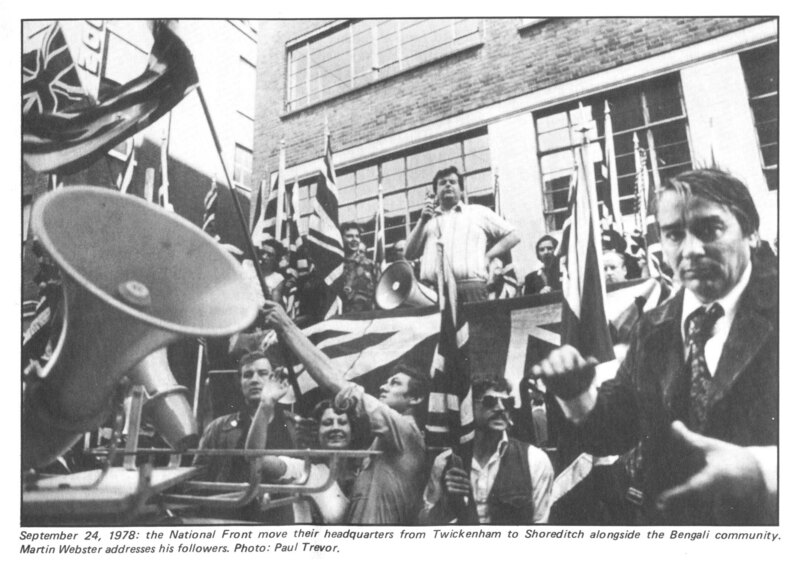 Today in London’s rebel past: Rent Strike Begins, Flower and Dean Street, 1939. 77 years ago today, one such rent strike started, in Flower and Dean Street, in London’s East End. In the 1880s, the Flower and Dean Street area was still a ‘rookery’, “the most menacing working class area of London”. The area between Wentworth Street and Spitalfields market was labelled the ‘Wicked Quarter Mile’, by outsiders of course. Partly to revive the moral middle class campaign to improve (ie clear and reduce the treat from) areas of endemic poverty, blocks of model dwellings were erected by early housing charities. Although there was genuine desire to improve the working class, there was also a feeling that the deserving and the undeserving poor needed to be separated, to prevent moral contamination of the former by the latter. However, housing here remained in many ways grim – overcrowded, unsanitary and not that cheap. The private landlords who owned much of the area charged high rents for crap conditions. Not that THAT dynamic still exists in London, oh no (in the week attempts to impose controls on landlords’ ability to rent out sub-standard housing was defeated, with the help of 73 landlord MPs). Into the 1930s and the terrible housing conditions in the area began to ignite discontent and collective action. Much of the grassroots work organizing tenants at this time was alter claimed to originate with members of the Communist Party (CP), who were strong and active in the area at the time – but members of the Labour party and other activists were also involved. In June 1933, a mass demo successfully defended family in Flower and Dean Street against eviction. But it was in 1938-9 that the struggle became huge, as mass rent strikes were organized in the borough of Stepney, which then included this area. The CP were heavily involved, and a useful short account of the rent strikes can be found in Phil Piratin’s book, Our Flag Stays Red. Piratin was a local CP member, who later became a CP councillor and MP. Two years of organizing among tenants in various streets and blocks came to fruition with rent strikes that erupted in 1938. Between August 1938 and mid-1939, tenants organized, refused to pay rent, and physically resisted violent eviction attempts. In the Flower and Dean Street tenements, most of the tenants were Jewish. Their tenants’ committee was led by a woman, Clara Garrett (women were often to the fore in the rent strikes, in the East End as elsewhere). The tenants decided to strike on January 16, and turned their building into a ‘fortress’. Demonstrations and picketing went on for weeks, all entrances were guarded, and there were even street marches publicizing the tenants’ demands for lower rents and repairs. One weekend, 38 children from this East End slum dwelling demonstrated in front of the landlord’s home, in fashionable and far-off Golders Green, a well-to-do London suburb. The owner finally caved in five weeks after the strike began; this struggle served as a prototype for many other actions. More rent strikes were also to break out in the East end during World War 2. And later, in the 1970s, many of the model dwellings built to improve working class housing in Spitalfields and Stepney had decayed themselves and become slums, and the same process would be repeated: plans were laid to scatter the residents and build new housing for a better class of inhabitant. Tenants resistance would again change the outcome… (but that’s for another day). Phil Piratin, Our Flag Stays Red. Henry Srebrnik, Class, Ethnicity and Gender Intertwined: Jewish women and the East London Rent Strikes, 1935-1940 (Women’s History Review, Volume 4, Number 3, 1995). Sarah Glynn, East End Immigrants and the Battle for Housing: a comparative study of political mobilisation in the Jewish and Bengali communities (Journal of Historical Geography 31 pp 528545) (2005). The silk weavers who lived and worked in large numbers around Spitalfields and Bethnal Green had a long history of organising to defend their livelihoods, whether threatened by wage cuts, by undercutting of pay rates by cheaper labour or mechanisation, or through the importing of cheaper textiles from abroad. They were notorious for tactics such as the smashing of mechanical looms which undercut their relatively high wage rates, boycotting or threatening employers who paid less than agreed rates for piece work, and slashing the clothes of the well-to-do who wore cheaper fabrics, such as Indian printed calico, rather than their woven silk. Several times in the 1760s disorder in the area became so constant that the government sent in troops or constables to repress the roving groups of ‘cutters’, who slashed silk on looms of offending masters. In many ways the Spitalfields silkweavers’ tactics and the pressures they faced anticipate those of the Luddites of the north and midlands in the early 19th century, though in notable ways the outcome was, at least in the short term, very different.